My fifth outing with Dirk Pitt adventures. NUMA undertakes an expedition in Mediterranean sea in search for a fish which could link to the evolution of mammals and also believed to be an extinct species 200 hundred millions year ago. The expedition was sabotaged, our hero Dirk Pitt is sent to investigate. A World War I biplane attacks the nearby Brady airfield, Pitt cleverly completes the puzzle thrown by his adversary through his wit and dare devilry. A lot of unexpected twist in the story, three characters one is Bruno von Till who is believed to be Admiral Heibert, Commander of Nazi Germany's transportation fleet, a fanatical follower of Adolph Hitler, and brother of Kurt Heibert. Second character Bruno von Till's niece a widow Teri and finally Darius the monster. Awesome engineering feats behind the smuggling of heroin through Minerva Lines freighter and the sunken cave of the villain are unexpected revelations for me. Two escapades of Dirk Pitt are worth mentioning and has the edge of the seat thrilling experience, one is escaping from the clutches of Bruno von Till's labyrinth and another from the deserted Queen Artemisia ship. Below two incidents which shows Pitt's cleverness and remained me of watching a MGR movie. One is after getting out of the car, Dirk Pitt with Willie the chauffeur. "Willie my friend, Pitt said seriously, I must tell you something. Will you step out of the car for a moment? Willie's brows wrinkled but he shrugged and stepped from the car, facing Pitt. Now Herr Pitt, what do you wish to tell me? I see you wear jackboots, Willie. Pitt flashed his best used car salesman's smile. And jackboots have hobnails, don't they? Ja, jackboots have hobnails, said Willie irritably. Why do you waste my time with such nonsense? I have duties to perform. What is it you wish to say? Pitt's eyes grew hard. My friend, I felt that if you want to earn your peeping Tom merit badge, it's my duty to warn you that silver rimmed spectacles reflect the sun's rays and can easily give your hiding place away..... and Pitt's fist slammed into his mouth, cutting off the words. Pitt's eyes searched von Till. Is that why you carry a Luger in a shoulder holster?" And one liner I like to quote when badly injured Pitt tries to enter First Attempt. "I'm Pitt and I'm injured. Now stop screwing around and hurry. Is it really you, Major? the lookout asked hesitantly. What the Goddamn hell do you want? snapped Pitt, a birth certificate?" 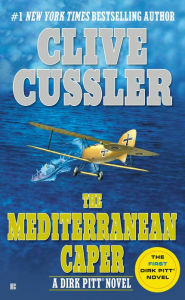 Yet another superb thriller from Clive Cussler, I enjoyed reading the book. Thanks Tom Sharp for your comment. That book was called MayDay also. Willie had a rough go with Dirk!! He got his nose broke then blown up and drowned when he tried shooting down the balloon rigged with explosives lol. Superb memory Dan Miller, thanks for additional information on the title of the book. Yeah, it's going to be good. Anything he writes is good. Thank you Justina for the comment. It is SUCH a good book. 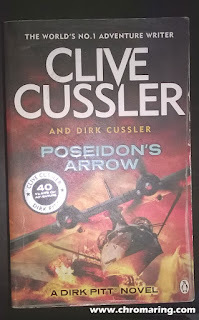 first introduction to Dirk Pitt, but It was published after some others I believe. who was the idiot who returned this to Cussler with a rejection letter. I think the book you are mentioning is Pacific Vortex, rejected by a publisher, couple of days back Walter Winterburn wrote a post about that in Facebook of CCC group. Thanks for the comment. It is a pity you have lost the copy.